В марте 1929 года бывший пилот британских ВВС флайт-лейтенант Николас Компер основал фирму "Comper Aircraft Company" для постройки самолетов собственной конструкции. Прототип Comper CLA.7 Swift выполнил первый полет в Бруклендсе 17 мая 1930 года. Swift, небольшой ДальшеMore>>> элегантный одноместный самолет, представлял собой моноплан деревянной конструкции с высокорасположенным крылом, обшивка - из фанеры и полотна. Крыло крепилось непосредственно к верхней части фюзеляжа, пилот размещался в открытой кабине за крылом. На прототипе стоял поршневой мотор А.В.С. Scorpion мощностью 40 л. с. (30 кВт). По завершении испытаний прототипа, в 1930 году было построено еще семь самолетов со звездообразным моторами Salmson AD9 мощностью 50 л. с. (37 кВт). На седьмой самолет поставили прототип звездообразного мотора Pobjoy Р в рамках подготовки машины к участию в гонках. Этот мотор выбрали как стандартный (в варианте Pobjoy R) и переоснастили им ранее построенные самолеты. Дольше всего эксплуатировался Swift (G-ACTF) с заводским номером S.32/9, построенный в 1932 году - самолет оставался в гражданском авиационном регистре Великобритании и в 2010 году, он находится в коллекции Шаттлуорта. Часть построенных самолетов после эксплуатации в Великобритании продали в третьи страны. THIS light aeroplane has been designed to suit the needs of those buyers who require at small cost a speedy tourer and sporting racer. For club use it is ideal for advanced solo work. When a pilot has passed his dual-control stage, he has to employ, with the present aircraft available, a two-seater 90-h.p. aeroplane which probably is ill-spared from the dual-control work for which it was designed. The solo pupil will, therefore, in nine cases out of ten have to wait his chance for the use of an instructional aeroplane, and then must pay for his solo flying at the higher rate of the two-seater. It should be borne in mind, too, that the costs of maintenance and repair of the larger aeroplanes are very much greater than those of a small single-seater, such as the one now being described. The "Comper Swift" has a high top speed of just over 100 miles an hour, a cruising speed of at least 80 miles an hour, and a range of 350 miles. This fact, coupled with the excellent comfort and vision, renders the aeroplane most suitable for long cross-country work. At the same time, its low landing speed of 30 to 35 miles an hour, combined with very carefully designed control surfaces and control system and the inherent stability peculiar to the parasol monoplane, promises great popularity for local flying by solo pupils, and, for the reasons expressed above, the pilot who has passed through his dual instruction stage can keep up his flying practice at a cost to himself which is so small that learning to fly need not come to a dead end after the pilot has obtained his "A" licence, as so often happens when clubs are solely equipped with the large and more costly two-seaters. For racing and sporting events this private owner's aeroplane has features which must be the envy of those owning larger, but not necessarily faster craft. Those who remember the little C.L.A. 3, the direct forerunner of the "Swift" - and its successes at the early Lympne meetings, know that races were won by this aeroplane partly because of its high top speed and partly because of its manoeuvrability round turning points. These features have been carefully preserved, while maximum vision in all directions has been added, which removes, perhaps, the only real danger of modern racing conditions. The high top speed is made possible by clean design embodying a minimum of external struts or fitments. For example, the shock-absorbing system for the undercarriage is actually in the fuselage and there are no external bracing wires or cables. The pilot's cockpit places the pilot aft of the monoplane wing, and the forward deck of the fuselage, which runs into the top surface of the wing, is so shaped that the pilot can see every point in the field of vision by a slight inclination of his head. It should be noted that the altimeter and speed indicator are mounted directly behind the rear spar on each side of the fuselage, as shown in one of our sketches – just where the pilot wants these instruments, and not mixed up with pressure gauge, level indicator and revolution counter, which are conventionally mounted on the main dashboard. Very simple and rapid "one-man" folding has been provided. To fold, one pin at the wing root is pulled forward, disengaging the front spar, and one pin is removed from the apex of the V-strut. The pilot then walks the V-strut (which swivels round its own attachments on the wing) to a clip at the wing tip. The rear spar being attached to the centre section by a universal joint, the pilot at the wing-tip can twist the wing to any position he likes preparatory to moving it round to a tail support. The same operation is repeated on the opposite side and the aeroplane is ready for garaging, the space required when folded being only 7 ft. 6 ins. by 18 ft. by 6 ft. The fuselage construction follows the practice adopted in the C.L.A. 3 and C.L.A. 4, and is a method of construction which has not only stood the service of years, but is also extremely robust for its weight. Built in three separate sections, repairs or replacements of damaged parts is a simple matter, effected at very low cost. It is a wooden girder construction, almost entirely devoid of bracing, diagonal wooden struts being attached to the longeron by means of ply plates or gussets screwed and glued to each side. The accompanying sketch will show the principle of construction. Distortion of the frame is virtually impossible under all conditions of temperature or climate. The tail plane is of symmetrical section, with an incidence adjustment of 4° range. 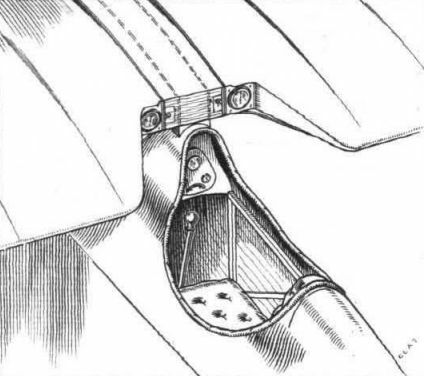 The undercarriage and principle of shock absorption is shown in another sketch. The axle is split, each half curving to a pin joint underneath the fuselage. The tops of the main struts are jointed to rocking frames inside the fuselage which carry spools for the rubber cord. The controls are of standard type with adjustments provided for the rudder bar. No disconnection of the aileron controls is needed when folding, as the transmission is effected by the contact of levers, which give a pushing action for a movement either way of the aileron lever. Wing area 90 sq. ft.
Wing loading 6-66 lbs./sq. ft.
Rate of climb 700 ft./min. NOTE. - Separate petrol tank in reserve for emergency. Second magneto fitted at small extra cost. Provisional price ^400. The Comper Aircraft Co. had intended exhibiting this machine at the forthcoming Aero Show at Olympia, and space had, in fact, been secured. Unfortunately, however, certain delays in laying down the firm's plant, etc., at Hooton Park, have rendered it impractical to get the machine sufficiently forward as regards construction and practical tests in time - especially as the firm wishes to present before the private-owner a job he can see has been thoroughly tried out and proved, and is as perfect in every detail as can be. It may interest our readers to know that the Comper Aircraft Co. are also starting construction of a totally-enclosed machine, to meet the requirements of those who wish for more than a single-seater, and it is anticipated that it will sell at a very competitive price. DESIGNED as a low-powered, low-priced single-seater, with a performance equal to that of the modern two-seater light 'plane, the Comper "Swift" is the first machine to be produced by F/Lt. Nicholas Comper since he left the R.A.F. and formed The Comper Aircraft Co., Ltd. That is not to say, however, that the "Swift" is the work of a beginner. Far from it. Before joining the R.A.F. several years ago, Mr. Comper was in the drawing office of the Aircraft Manufacturing Company, and after joining the service he designed, it will be remembered, the series of Cranwell machines, C.L.A. 1, C.L.A. 2, C.L.A. 3, and C.L.A. 4, for the Cranwell Light Aeroplane Club. These machines all showed originality coupled with common sense, and Mr. Comper is one of the few designers who has for many years held the belief that high power is not necessarily required in order to get a good performance out of a light 'plane. The C.L.A. 2 was a side-by-side two-seater with Bristol ''Cherub" engine, and at the Lympne Light 'Plane Meeting of 1924 this machine piled up, during the meeting, just under 18 hours' flying and a mileage of 762-5 miles, thereby winning the ?300 Reliability prize offered by the S.M.M.T. for the greatest number of completed laps of the Lympne course. The C.L.A. 3 was quite a different type of machine, being a parasol single-seater monoplane with Bristol "Cherub" engine. That machine made its first public appearance at the Lympne race meeting of August, 1925, when it won the International Scratch Speed Race for light aeroplanes, and was favourably commented upon for its high speed and good manoeuvrability. Finally, it may be recalled that the C.L.A. 4 was designed and built for the Daily Mail two-seater light 'plane competition held at Lympne in 1926. The design of this machine was based upon the Pobjoy engine, but as that engine did not manage to pass its tests for the Air Ministry C. of A. in time, a Bristol "Cherub" of much lower power was fitted. Although this naturally detracted from the performance, the C.L.A. 4 was still a very nice little machine, and had a very good performance for the power of the engine. Its most unusual feature was that, although a sesquiplane, its top wing was smaller in span and chord than the lower wing. Of previous Comper designs, the C.L.A. 3 was that which the new "Swift" most closely resembles, and from which it may, in fact, be said to have been evolved. That the "Swift" represents a very considerable improvement on the C.L.A. 3 is hardly to be doubted, and this improvement is not confined to performance only, i.e., speed, climb, etc. but also includes controllability, comfort for the pilot, and generally better appearance. Concerning the last-mentioned feature, the "Swift" is one of those machines which one comes across occasionally, which do not look especially "pretty" in the 3-view general arrangement drawings, but which are found to have very good lines when seen "in the flesh." The photographs which accompany this article bring out this point rather well. For example, the side elevation of the general arrangement drawings show a fuselage which is very deep in front, and which might be expected to cause the machine to look somewhat heavy and "fat." Yet when one looks at the photographs, and even more when the actual machine is inspected, the appearance is one of slimness and, it might almost be said, daintiness. In other words, such a machine as any private owner might be proud of, and "pride of ownership" is not a quality which the designer of light 'planes for private owners can afford, nowadays, to disregard. The Comper "Swift" starts life well, in that it has a very distinctive appearance and extremely pleasing lines. Nothing is so likely to make a pilot dissatisfied with his mount as a poor view. For each "blind spot" in a machine, the pilot is apt to lose a certain amount of confidence, and many an otherwise excellent machine has failed to become popular merely on this count. Knowing this, F./Lt. Comper set himself the task from the beginning, in designing the "Swift," to produce a machine with the best possible view. In a single-seater using a very light engine this is not easy of accomplishment. If the wing is to be on a level with the pilot's eyes, as it should be to get view upward and forward, it means placing the pilot aft of the wing and not under it. To counteract the rearward placing of the pilot's weight, the engine must, being quite light, be pushed forward of the wing a considerable distance, and this results in a fair amount of vertical surface ahead of the centre of gravity. To bring the centre of vertical area aft of the e.g., fairly large tail areas (i.e., fin and rudder) are required, and it will be observed that in the "Swift" these two organs are large in proportion to the small size of the machine. When examining the "Swift" with a view to assessing the value of its aerodynamic design, one is impressed by the cleanness of its lines. The fuselage, no wider than strictly necessary, is deep but of almost perfect streamline form except for the coaming of the cockpit. The monoplane wing rests on but a narrow portion of fuselage, and so the portion of wing rendered inefficient in the centre is a very small proportion of the wing area. A single pair of vee struts on each side brace the wing, and the undercarriage is partly housed inside the fuselage, at least the shock absorber portion. The tail is almost pure cantilever, with but a single short stabilising strut on each side. Altogether the aerodynamic design strikes one as having been very carefully thought out. Structurally the "Swift” has a great deal of family resemblance with previous Comper designs, the fuselage being a light fabric-covered girder composed of longerons and diagonal struts attached to the longerons with three-ply wood gussets. This construction is light for its strength, and does not require any trueing-up after prolonged use. The fuselage is actually built in three separate units, the front portion carrying the engine mounting, the cockpit portion, and the tail-carrying portion. The wing is of equally simple construction, with two spindled-out spruce spars and light girder ribs. The wing is in three sections, of which the very narrow centre-section is built as an integral part of the fuselage, on two of the bulkheads of which it rests. The wings are designed to fold, so that the machine, in itself quite diminutive, will occupy a very small space indeed when folded. The wing covering is fabric. All wing fittings are of simple steel plate type. The undercarriage is somewhat unusual, and its arrangement may best be understood by reference to the accompanying sketch. The axles are bent, and the wheels located in a fore and aft direction by rearward-sloping radius rods. The "legs" run to internal members carrying the shock absorbers, which are housed entirely inside the fuselage and thus offer no extra drag. While appreciating F. /Lt. Comper's desire to cut down drag, we think we should have preferred to take the undercarriage "legs" up to the vicinity of the top longerons. This would add a little exposed strut length, but should make for greater stability on the ground. 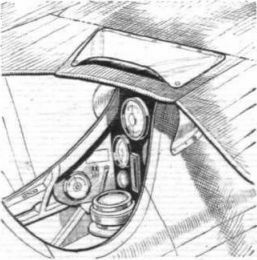 The cockpit is very comfortable, and the instruments have been arranged in a manner which facilitates reading of those most frequently required, and which are not "mixed up" with those that only need an occasional glance. The altimeter is mounted on the back of the rear spar, on the port side, and the airspeed indicator in a similar position on the starboard side. The other instruments are mounted on a dash inside the cockpit. The petrol is carried in a gravity tank with a capacity of 9 gallons, located in the deck fairing aft of the engine. Actually the tank has a partition which separates one gallon put of the nine from the main supply. Thus when the bulk of the petrol is used up, the pilot turns on the reserve gallon, which leaves him ample time to search out a landing ground before his supply is exhausted. The A.B.C. "Scorpion" engine is mounted on special patented vibration-absorbing units, which have been found after extensive use to reduce almost to vanishing point the amount of vibration transmitted to the fuselage structure. The dimensions of the Comper "Swift" are: Length, o.a., 18 ft. 9 in. ; wing span, 24 ft.; wing chord, 4 ft.; aspect ratio, 6; wing area, 90 sq. ft.; tare weight, 350 lbs. ; gross weight (for aerobatic C. of A. ), 670 lbs. ; wing loading, 7-4 lbs./sq. ft.; power loading, 16-7 lbs. /h.p. It is estimated that the "Swift" will cruise at something like 80 m.p.h. for a petrol consumption of 40 miles per gallon. The machine has not, at the moment of writing, been tested at Martlesham, but it is estimated that a top speed of 105 m.p.h. should be attained, while the landing speed should be about 35 m.p.h. The range at cruising speed should be in the neighbourhood of 350 miles. As the Comper Aircraft Co., Ltd., is a comparative newcomer to the British aircraft industry, a few words concerning its composition may not be without interest. Upon leaving the Royal Air Force, Flight-Lieut. Comper decided to form a small company for the purpose of building and marketing certain types of aircraft which he has had in mind for some considerable time, but which could not well be realised while he was serving in the R.A.F. The company as at present constituted includes on the board of directors Flight-Lieut. Nicholas Comper (managing director), Mr. G. H. Dawson (chairman), Mr. Adrian Comper, Mr. A. Moulsdale, and Mr. J. B. Allen. The head office and works of the Comper Aircraft Co., Ltd., are situated at Hooton Park Aerodrome, Cheshire, the works having been built during the War for the erecting of American-built Handley Page machines. The Armistice came, and the works were not required, but they will now be put to good use. Hooton Park aerodrome is situated on the strip of land between the estuaries of the rivers Dee and Mersey, and is within a few miles of Birkenhead and Chester. The aerodrome itself is a very good one, and the situation is such that there would be no great difficulty in arranging for testing seaplanes, should the firm decide later to produce this type of machine. The workshops are so arranged that the raw material enters at one end and the finished machines emerge at the other, on to the actual aerodrome. Moreover, the shop space available permits of expansion to almost any extent, so that altogether the firm is in a favourable position to go into quantity production with its machines, of which the "Swift" is the first. FLT.-LT. N. COMPER, when he left the R.A.F. and formed the Comper Aircraft Co. with its works at Hooton, near Birkenhead, had already had experience of designing and building very light aircraft, as he designed and built the series C.L.A.1 - 4 for the Cranwell Light Aeroplane Club. The idea lying behind the Swift is that high power is not necessary for high performance, and also that there is a market for the very light and cheap single seater, provided it has a good performance. The Swift is the first machine from this new factory, and so far gives promise of more than fulfilling the expectations of its designers. It is a machine which looks far better than drawings would lead one to suppose, and one that should have a very great appeal to those who wish to own a single seater with a particularly "snappy" performance. There will undoubtedly always be a demand for the single seater, just as there is a demand for the sports model motor-cycle and the Swift, with its top speed of about 105 m.p.h. can certainly claim to be a sports model in the very light class. The small engine, an A.B.C. "Scorpion," will make it an economical machine to run and whether for merely sporting purposes or for those who wish to get in sufficient flying hours to qualify for their "B" licence, it should prove a good proposition. Among the many points of good design are, firstly, the attention which has been paid to the pilot's view, and though the means of obtaining this appear at first sight somewhat unorthodox, they are very successful. Then, secondly, the undercarriage has been designed to give a minimum of drag, and all the shock-absorbing mechanism is carried inside the fuselage so that the part of the compression leg which is usually outside in the slipstream, and is rather large, is, in this case, a normal thin strut, and therefore offers very little resistance. ORIGINALLY designed for, and fitted with, the A.B.C. "Scorpion" two-cylinder engine of some 35 h.p., the "Swift" monoplane produced by the Comper Aircraft Co., Ltd., of Hooton Park Aerodrome, Cheshire, has undergone development in the direction of more and more power, accompanied by a corresponding increase in performance. First came the "Pobjoy Swift," made possible by the passing in fine style of the very light little Pobjoy "R" engine of 75-80 b.h.p. That type quickly "made history." On one of them Mr. Butler flew to Australia in record time, continuing his touring afterwards and piling up an impressive mileage. On another Mr. Taylor twice flew across the Andes mountans, clearing this little "obstacle" with plenty to spare. Yet another variant of the "Swift" is to appear soon. Designed specifically for the King's Cup Air Race (one has been entered by H.R.H. the Prince of Wales), this is fitted with a de Havilland "Gipsy III" inverted engine, and doubtless will in time find many uses other than racing. No photographs of the Gipsy-engined "Swift" are available at the moment, but the general appearance is well shown in the scale drawings. The "Gipsy III" is somewhat long and deep for such a tiny little machine, and at first one is apt to regard the "Pobjoy Swift" as the better looking of the two types, although doubtless familiarity will soon accustom one to the altered appearance. The "Gipsy Swift" is not, of course, intended to supplant the "Pobjoy Swift," but will be an alternative type, both being available to the buying public. Generally speaking, the "Gipsy Swift" does not differ materially in design and construction from the "Pobjoy Swift" other than in the matter of engine and installation. The wing dimensions remain unaltered at 24 ft. (7,32 m.) span and 90 sq. ft. (8,36 m2.) wing area. With the heavier engine, etc., the gross weight goes up to 1,130 lb. (514 kg. ), which brings the wing loading up to 12.55 lb./sq. ft. (61,5 kg./m2.). The power loading is, however, low at 9.42 lb./h.p. (4,28 kg./CV). For obvious reasons it is not possible to give definite performance figures at present. That the new machine will be considerably faster than the Pobjoy-engined model is to be expected, the power having been increased by some 50 per cent, and the frontal area and overall drag coefficient probably remaining substantially as before. Owing to the fact that the wing loading has increased, the rate of climb, which was always very spectacular in the "Pobjoy Swift," will very likely be but little altered, and we should imagine that it is mainly in the matter of speed that the new type will score. When the "Swift" is fitted with the "Gipsy III" engine the tare weight of the machine becomes 730 lb., which leaves a disposable load of 400 lb. It is intended that the normal weight of fuel and oil shall be 180 lb. (22 gallons of petrol), so that the useful load, i.e., pilot and luggage, etc., becomes 220 lb. For a pilot of average weight this leaves a very good margin for luggage, and the machine should enable the private owner who wishes to use the machine for touring at high speed to take with him enough "spare clothes" for even fairly extensive tours. As both the machine and its new engine are thoroughly well tried out, the reliability of the combination should be satisfactory, and the only subject left for speculation is the speed. That we shall probably not know until the end of the King's Cup Race on July 8-9. Everyone will wish His Royal Highness every possible good fortune in the race. The Comper Aircraft Co., Ltd. ALTHOUGH other designs are on the way, the Comper Aircraft Company has at the present time but two aircraft types actually on the market, the "Pobjoy Swift" and the "Gipsy Swift." A modified version of the "Pobjoy Swift" is the commercial "Swift." The original "Swift" was designed for the A.B.C. "Scorpion," and was offered for a time as an alternative to the "Pobjoy Swift." Now, however, the "Pobjoy Swift" is regarded as the standard machine. It is a small single-seater specially intended for the private owner who wants good performance. It is mainly of wood construction, with a relatively few steel fittings at highly stressed points. The fuselage has a curious fin back to which the wing halves are attached, and consequently the view straight ahead is obstructed. The angle is, however, so small that this is not important, and the pilot can, by leaning his head slightly to one side or other, look straight ahead. The monoplane wing is strut braced and has a neat folding arrangement which does not require jury struts to brace the wing in the folded position. A very neat undercarriage is fitted, using Goodyear airwheels as standard. The shock-absorbing system is housed inside the fuselage. A commercial model of the "Pobjoy Swift" is intended for feeder line air mail work, survey or communications. Its tare weight is 540 lb. (245 kg.) and its disposable load 530 lb. (241 kg. ), giving a gross weight of 1,090 lb. (495 kg.). When the tankage is 15 gallons (68 litres) the range is about 380 miles (611 km.) and the pay load 225 lb. (102 kg.). If the tank capacity is increased to 25 gallons (114 litres) the range is increased to 630 miles (1 000 km.) and the pay load decreased to 115 lb. (53 kg.). 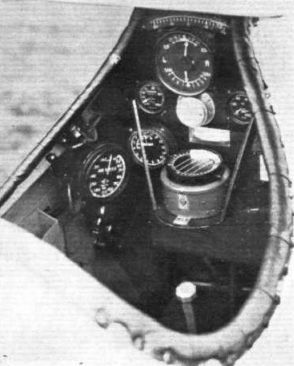 The cockpit of the C.(L.A.) 7 "Swift," showing the altimeter and speed indicator mounted on the rear spar. Tempering the wind - a deflector noticed on a Comper Swift.